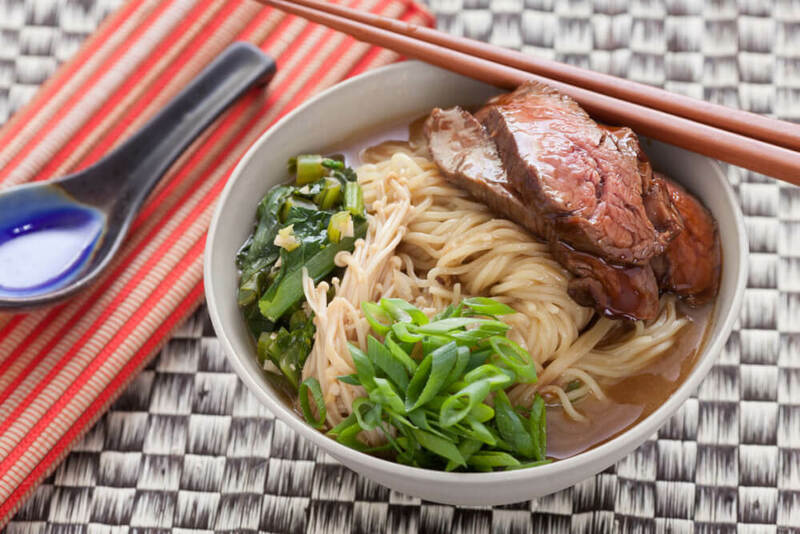 Look no further than this beef ramen soup recipe if you're looking for true comfort food. There is a little spicy kick in each mouthful and we are adding beef and egg to make it more filling. Leave out the egg if you prefer. This is a healthy soup because we're using carrots, celery, yellow onion and spring onions, along with all the protein promised by the beef and egg. 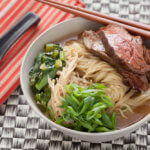 Kids will also enjoy this ramen soup but, depending on their ages, you might want to omit the Sriracha. 1. Heat the oil in a pot over a moderately high heat. 2. Add the carrots, celery and onion and cook for 10 minutes. 3. Now add half the parsley and all the garlic, and cook for 1 minute. 4. Pour in the chicken and beef stock, soy sauce, Sriracha, soy sauce and water. 5. Grind in some salt and black pepper to taste. 6. Bring the mixture to a boil then turn down the heat and simmer 10 minutes. 7. Meanwhile, season the steaks with the onion, garlic and ginger powders, as well as some salt and pepper. 8. Sear for 2 minutes per side. 9. Soft-boil the eggs for 6½ minutes if using, then plunge them in icewater to cool and peel. 10. Chop each one in half. 11. Now you can add the ramen noodles to the pot and cook the soup for 3 minutes. 12. Divide the finished soup between 6 serving bowls. 13. Top each with the beef, egg halves (if using), the rest of the parsley and the spring onions.